This weekend's Mystery Foto was inspired by Brian McCarthy's discovery of 1926 and 1950 aerials found at the MyNassauProperty.com website. North is up. Looking west to east; Albertson, Williston Park, Roslyn Heights, East Williston, Westbury and Old Westbury. West to east: Long Island Motor Parkway, Willis Avenue, Oyster Bay LIRR Branch, Roslyn Road, Guinea Woods Road (Glen Cove Road), and Hillside Avenue (East Williston Road). 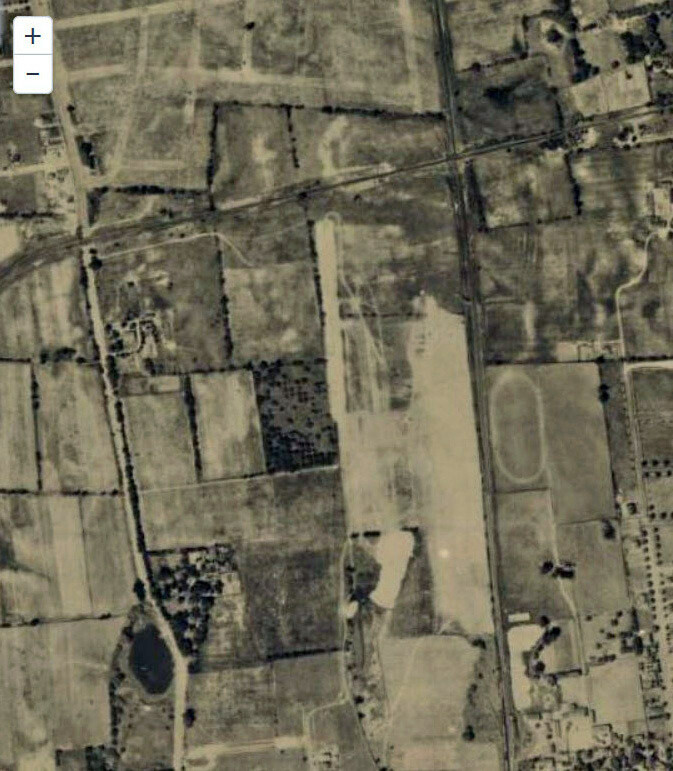 Congrats to Joe Oesterle, Frank Mendyk, Greg O., Brian McCarthy, George Philippides, Tim Ivers, Sam Berliner III, Frank Mendyk, Steve Lucas, Dave Russo, Dave Kilkenny, Frank Femenias (see below Femenias Findings) and Ernie M. for correctly identifying the Mystery Foto aerial. Kudos to Brian McCarthy for forwarding the MyNassauProperty.com website and Frank Femenias for his always amazing overlays. Finding 1926 and 1950 Nassau County Aerials Submitted by Brian McCarthy. Click on the maps and aerials on the MyNassauProperty.com website. Place the mouse on the desired location and click. Zoom in by clicking or using the +/- . Keep zooming until the current aerial appears. Note: You may need to click on the corner to move the pesky address insert. Click on the Layer tab and select the desired year (1926, 1950, 2000, 2004, 2007, 2010 or 2013). Note: You may have to repeat the process when switching years. Motor Parkway (on top) crossing Oyster Bay LIRR tracks and Roslyn Road. The Roslyn Lodge (black building) can be seen west of Roslyn Road. Wheatley Hills Golf Club with the farmway bridge connecting the course. Far right is Guinea Woods Road (Glen Cove Road). On the bottom is East Willston Road (Hillside Avenue) with its Motor Parkway bridge. Just above the bridge is the golf clubhouse, formerly the Totus homestead. Location: Roslyn Lodge (Restored but still standing) and Roslyn Road Bridge. LIMP enters left, crosses Willis Ave, LIRR, Roslyn Rd, and I am trying hard to see the farmway bridge that is supposed to be just east of Roslyn Rd. Then it turns south through Wheatly Hills Golf Club, and crosses over Hillside Ave. I also see the old Willis House, and the old pond across Willis Avenue. 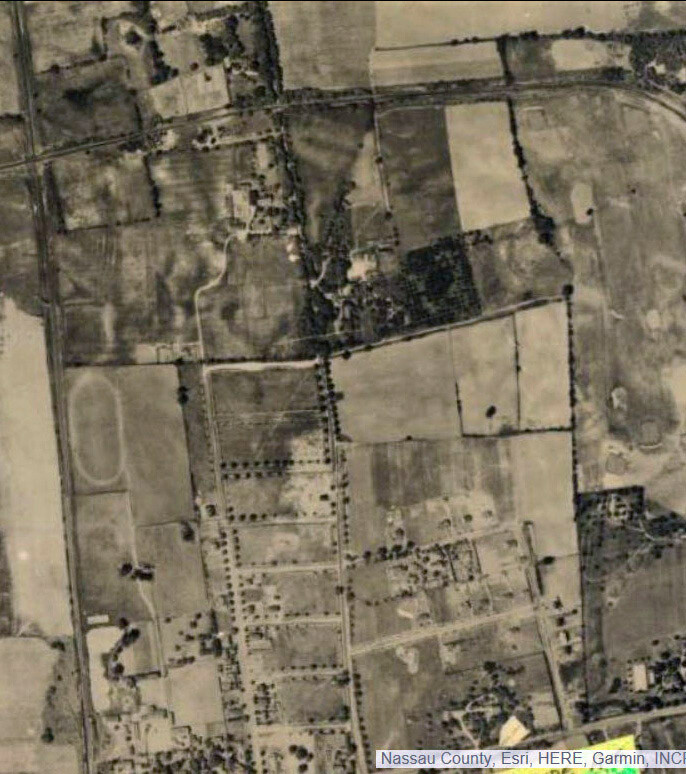 I believe there was an old horse farm just east of the LIRR north of Hillside Ave. We can also see than Wheatly Hills Golf Club has expanded over the years. We can see the old houses that were just north of the LIMP on Willis Ave on the west side. I believe at least one of those houses still stands today. The ‘Happiness Homes’ in Williston Park have not yet begun construction. North of the LIMP east of Willis Ave we can see the street have been gridded, but no houses appear. The location of the mystery photo is a section of the LIMP from Willis Ave to Hillside Ave. This would include the towns and villages of Albertson, Williston Park, East Williston and Old Westbury. The major roads in the photo would be Willis Ave, Roslyn Rd, Guinea Woods Rd (Glen Cove Rd), and Hillside Ave. The golf course seen in the photo is Wheatley Hills golf club. -LIMP, Glen Cove Rd, Willis Ave, Hillside Ave.
-Roslyn Lodge, Willis Ave bridge, LIRR bridge, Roslyn Rd, Robbins Lane, Wheatley Golfway Bridge, Hillside Ave.
Glad to be an inspiration for this Mystery Foto, Howard! *LIMP Bridges & Buildings: Willis Ave, Oyster Bay Branch LIRR, Roslyn Rd, Robbins La, Wheatley Hills Golfway ( was originally designated as a Farmway type for the Titus Farm ), and Hillside Ave. Large building just w/o the LIMP was originally the Titus Home, but then became the initial clubhouse for the golf course in 1913. The building further west is the present day clubhouse. This is a view of the LIMP circa 1928, overlooking the Wheatley Hills Golf club. LIMP cuts through the golf course North-South. In the center of golf course is a bridge over parkway connecting two halves of golf course. Hillside avenue is left to right, on southern border. LIMP running west crosses Roslyn Road, which had a bridge. East Williston, showing the LIMP curving through the Wheatley Hills Golf Course? Glen Cove Road on vertical right. Hillside Avenue across bottom, and LIMP bridge over Hillside visible lower right. also on the top of the photo looks like mitchell field or roosevelt air field.??? The location of the mystery photo is a section of the LIMP from Willis Ave to Hillside Ave. This would include the hamlets and villages of Albertson, Williston Park, East Williston, and Old Westbury. Major roads - Willis Ave, Roslyn Rd, Guinea Woods Rd (Glen Cove Rd), New York State Route 25B ( Hillside Ave, East Williston Ave), and the future ROW for New York State Route 908G (Northern State Parkway). LIMP bridges - Willis Ave, LIRR Oyster bay Branch, Roslyn Rd, Robbins Lane, Wheatley Hills, and Hillside Ave. Golf Course - Wheatley Hill golf club. We’re looking at an aerial view over East Williston with north at the top of the photo. The LIMP enters at the left, heads east and then curves south with bridges over Willis Avenue, LIRR Oyster Bay Branch, Roslyn Road and Hillside Avenue. Also in view is the “golfway” bridge in the middle of Wheatley Hills Golf Course and the Roslyn Lodge just west of Roslyn Road. The other major road is Glen Cove Road running north - south near the right side of the photo. Upon first glance from west to east that looks like LIMP going over Willis Ave, then over Roslyn Road, proceeding into what is now Wheatley Hills golf course, making the sharp turn south to avoid the rich/powerful people of Old Westbury, just like the Northern State was forced to do and crossing over Hillside. Brian thanks for map tip. Very cool. 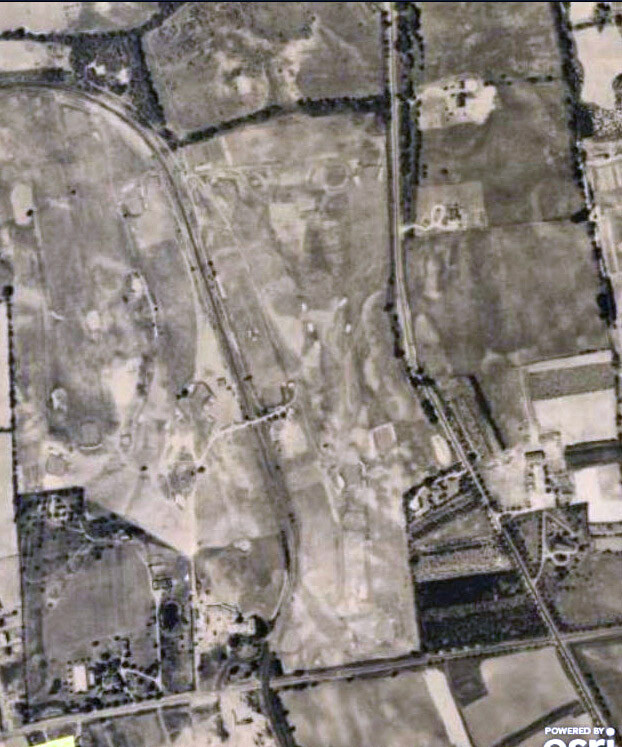 Strange thing….I tinkered around w it for a few mins and it appears the 1926 aerials are more clear/concise then the 50’s. you would think it would be the opposite. This is a view of the MP directly over Williston Park, Roslyn, Albertson and East Williston - starting from Willis Avenue on the left thru the Wheatley Hills golf course. You can also make out the Roslyn toll lodge. MP crosses over Willis, LIRR, Roslyn Rd, Hillside Ave. I believe you can also make out the home of Willis on the bottom left by the lake. I’m not sure when the home was demolished. Nice find producing another fantastic aerial! 1926 East Williston with north up. A rare view of still intact Motor Pkwy bridges that have ALL been taken down and gone forever. From left to right are; Willis Ave bridge, Oyster Bay LIRR bridge, Roslyn Rd bridge, after the curve southward the Wheatley Hills Golf bridge, and the Hillside Ave bridge. Motor Pkwy was built four years before the golf course and club members could access the clubhouse from the parkway. Howard, sending an overlay. We’re looking at East Williston. North is up. 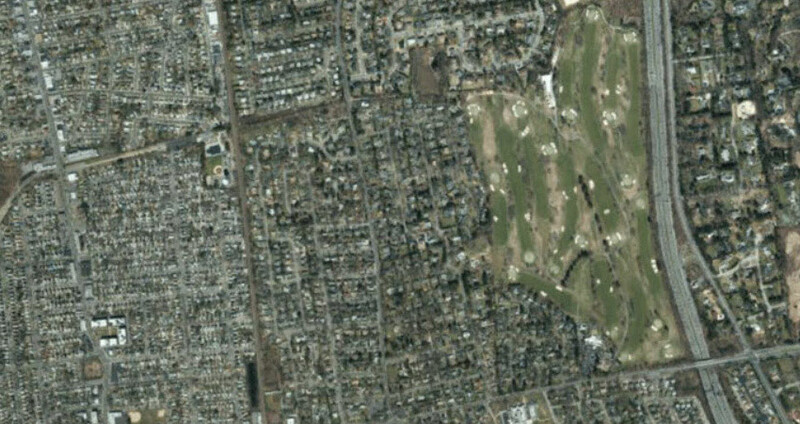 You see the LIMP enter at the bottom where it jumps over Hillside Avenue before entering the Wheatly Hills Golf Club, then curving left (west) near the top of the image. There is a bridge for golfers there! Glen Cove Road is to the right (east). Dave Russo….I was delighted that the 1926 maps are clearer than the 1950 ones. Your seeing the parkway in it’s magnificence! Here’s another neat trick…locate the Robbins La Pkwy Bridge ( Between Roslyn Rd and Wheatley Hills Golf Course ) on the 1926 or any of the other maps, then click on the location. The current property info will display. It matches perfectly with Frank Femenias"s submitted aerials. Also want to point out that Mr. Berliner has had these maps for years, and the maps are on his website. I just came across the Nassau County site because of extensive internet searching.